In Massachusetts a clerk magistrate hearing or a show cause hearing can be scheduled in lieu of a formal arrest. A clerk magistrate hearing is a hearing given when an individual attempts to take out a private criminal complaint against another person or when the police officer does not witness the criminal conduct that gives rise to the charge. OUI charge involving an accident where the motorist is taken to the hospital. The hearing itself is held before a clerk of the court. The hearings are often held in an office and are informal. The party that has accused you of committing a crime, either the independent party who filed the claim or a representative from the police department who is requesting that the complaint issue, will appear to describe their version of the incident. You will then be given the opportunity to make a statement on your own behalf. An experienced criminal defense attorney will be able to help you present your case. There are arguments an attorney may make and they will depend on the specific to certain charges and the background of the client. While you can choose to testify it may not always be in your best interest. An experienced criminal defense attorney will be able to advise you on when you should and should not testify. What is the standard at the Clerk Magistrate Hearing? DelSignore Law recently represented a young man charged with possession with intent to distribute, a fairly serious offense with severe penalties. At the Clerk Magistrate hearing DelSignore Law was able to make an argument on behalf of their client and his case was continued for 6 months with the condition that he have 3 drug tests within that time period and complete a drug program. At the end of the end of the 6-month period he had completed all his conditions and the case was dismissed. The case was never arraigned so his criminal record is still preserved. There is no formal record to indicate that he ever faced these charges. In another recent success, DelSignore Law represented a client charged with trespass and breaking and entering. DelSignore Law was able to convince the clerk magistrate that the complaint should not be issued based on the client’s history and the time difference between the actual offense date and the date of the hearing. The complaint was not issued and the client has no criminal record. What happens if the complaint is issued? 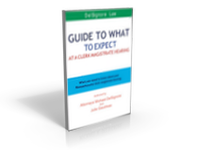 Download a free copy of "Guide to What to Expect at A Clerk Magistrate Hearing"
If the clerk does issue the charge your case will be sent to the district attorney’s office and you will face a formal arraignment in the district court. This means that you will have a criminal record. If your case is scheduled for a magistrate hearing, you should hire an experienced Massachusetts criminal defense lawyer immediately. If you have any questions about a criminal magistrate hearing in Massachusetts feel free to call or send an email through this website. You can reach me on my cell phone at 508-455-4755 or 781-686-5924.